Da iawn ni! Dyma adolygiad 5 seren o'n sioe Aladdin. ‘There is nothing like a dame,’ so the song goes - and that’s certainly true of this year’s RCT panto Aladdin. Widow Twanky maybe a stock pantomime character but few could have played it with such a joyous, OTT vivaciousness than Frank Vickery. When he’s not spending his Decembers dressing like an explosion in a haute couture factory (and whoever designs his outfits needs plaudits for the hilarious scope of their technicolour vision) Vickery is one of Wales’ most acclaimed playwrights – his preternatural comic timing as finely honed as his ability to put words to a script. In this instance, however, it’s to brilliant writer and director Richard Tunley who we must credit responsibility for piecing together a beautifully constructed knockabout romp which doesn’t let up from first minute to last. As far as the story is concerned this take on Aladdin is traditional panto fayre in every sense. Lacking a big budget for special effects like many big city pantos RCT Theatres’ offering relies on the strength of its writing and the quality of its cast. It might be old school in that respect, but the story of Aladdin (Maxwell James) the son of the washer woman who finds forbidden love with Princess Jasmine (Laura Clements) is given a modern makeover with plenty pop culture references for young and old alike. It’s also a pure entertainment experience with plenty of familiar songs – from the world of pop and musicals, as well as some whipsmart choreography – credit to young backing dancers the Take pART crew their lively performances here. 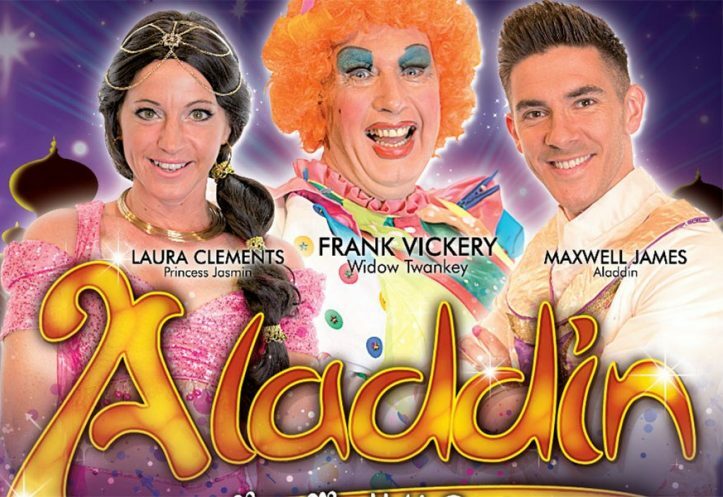 However, it’s the slapstick comedy and wonderfully funny turns from Vickery as Widow Twankey and his son Wishee Washee – played with an energetic zeal by the bedazzling Ryan Owen, that elevate this particular panto to brilliant new heights. The farce is most definitely with them, as it is with bumbling coppers PC Ping (Bridie Smith) and PC Pong (Aled Davies), who both make for an arresting sight. When you factor in not one but two most excellent genies – Tamara Brabon as the Genie of the Ring and Deiniol Wyn Rees as the Genie of the lamp, and a most villainous villain in the form of the wicked Abanazer, played by Lee Gilbert - who frankly is so good in the role the boos ring out throughout his malevolent showing, then this is a pantomime that ticks every box – and probably some yet to be discovered.